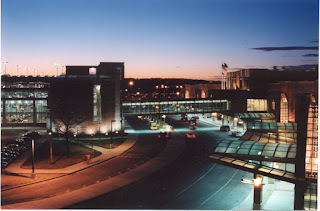 A few weeks ago, we were at Albany Airport to drop off a traveler. The lines at Southwest and the security checkpoint were noticeable but our traveler got through them and was at the gate with time to spare. Then a week later, on Sunday morning, we went to the Airport for a trip to Washington, DC. The Southwest flight was like a dawn patrol. It left at 6 AM and we were there an hour before the take off. When we arrived at 5 AM, the line at Southwest was nearly out the door. Dorothy, in a moment of quick thinking, offered to check in the baggage and sent me to wait on the security line. This line was just as long as the one at Southwest. By the time Dorothy got to the check in station, she heard a Southwest staffer say the airline was closing baggage acceptance for our flight. Because I had short sightedly packed items I needed for a conference that day, she did not want to arrive with no luggage and the staffer gave her the bags to go through security. With a TSA pre-board she got through security fairly quickly. I got through security, too, but was so close to the flight boarding time that I ran to the gate with belt and shoes in my hands. Because of this near miss with the plane, I contacted Doug Myers at the Albany Airport, to ask him about what might be causing the longer line. Myers has observed the lines become especially crushing on Monday and Tuesday mornings and Sunday evenings, with the crowds driven by business travelers and returning vacationers. The long lines we were in seemed to be mostly vacationers headed for Florida’s warmth - - although temperatures in that state have not been that much hotter than the Capital Region until recently - - and people headed for Vegas. The trend towards longer lines is not likely to end soon. Myers observed that when Jet Blue began service in Albany, “the load factors were above national averages.” Jet Blue may spur more air travel on other airlines. When a low-cost carrier enters a market, it introduces competition and motivates existing airlines to offer lower fares, which will persuade some non-fliers to take off. The arrival of Jet Blue at Albany Airport has also added to crowds at the Airport. Informative and we'll written, Mr. Johnny. Thanks for reading and writing back. Update: To all my readers: I got two comments via e-mail. One person expressed appreciation for the post but observed, mordantly, that "The friendly skies just keep getting less friendly." Another offered some specific information on Albany Airport wait-times. He observed, "We went to Florida, leaving on an 11 AM Monday flight and returning on an 11:30 AM Thursday flight. The lines were ok both times." However, "On a Saturday before a school vacation, the line was so long it went out of the security area, across the lobby, onto the pedestrian bridge between the terminal and garage and then doubled half way back." Fabulous photo of the AIA! Whoah look at that night view--beautiful!! The Real Story about Ground Hog Day!